The Amateur Radio Emergency Communications Enhancement Act, which died at the end of the 111th Congress, has been reintroduced in the 112th Congress as HR 81. The sponsor is Representative Sheila Jackson Lee (D-TX-18). The new bill -- which was introduced on January 5 -- has been referred to the House Committee on Energy and Commerce. "We are hopeful that this early start will lead to success in the new Congress," commented ARRL Chief Executive Officer David Sumner, K1ZZ. Rep Jackson Lee first introduced the bill -- HR 2160 -- in the 111th Congress in April 2009. It gained an additional 41 cosponsors but did not progress out of the committee of jurisdiction. A similar bill introduced in the Senate -- S 1755 -- made it all the way through that body in December 2009, but likewise was not taken up by the House. The objective of the bill -- which is supported by the ARRL -- is for the Secretary of Homeland Security to study the uses and capabilities of Amateur Radio communications in emergencies and disaster relief and to identify and make recommendations regarding impediments to Amateur Radio communications, such as the effects of private land use regulations on residential antenna installations. The FCC has issued a Hearing Designation Order to determine, among other things, if the Amateur Radio license of Glenn A. Baxter, K1MAN, of Belgrade Lakes, Maine, should be renewed. According to the Order, "Baxter has apparently willfully and repeatedly engaged in unlawful Commission-related activities, including causing interference to ongoing communications of other amateur stations, transmitting communications in which he had a pecuniary interest, failing to file requested information pursuant to an Enforcement Bureau (Bureau) directive, engaging in broadcasting without communicating with any particular station and failing to exercise control of his station." Baxter, whose amateur license expired in 2005, filed a timely renewal on July 22, 2005; his license expired on October 17. Because of the timely renewal, Baxter's license remained in effect past the expiration date. 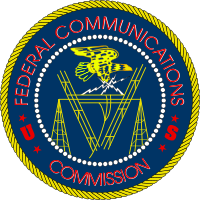 The FCC said it "believe[s] that Baxter's apparent continuing course of misconduct raises a substantial and material question of fact as to whether he possesses the requisite character qualifications to be and remain a Commission licensee." In the final hours of 2010, tornados swept across Missouri, Illinois and Arkansas, leaving at least seven people dead. Hams in Missouri -- one of the hardest hit areas -- activated nets and provided real-time weather observations to the National Weather Service. According to a timeline of events in the St Louis Post-Dispatch, hams in the towns of Pacific, Ballwin and Sunset Hills in Missouri, as well as a ham in O'Fallon, Illinois, were among the many who spotted and reported twisters and severe weather to their local NWS offices. Steve Runnels, KD4OPZ -- the Warning Coordination Meteorologist at the NWS office in Springfield, Missouri -- said that he was impressed by "the amount of Amateur Radio support we received during the overnight and into the early morning hours. This proves that the Amateur Radio community is always ready. It also shows the strength of their commitment to the communities they live in and the National Weather Service's mission to protect life and property." Read more here. VHF operators will be on the bands in force the weekend of January 22-24 as the ARRL January VHF Sweepstakes hits the airwaves. This contest gives the VHFer in all of us a chance to do some contesting during the winter months. According to ARRL Contest Branch Manager Sean Kutzko, KX9X, January may not seem like the ideal time to hold a VHF+ contest, but sometimes he said, the propagation gods like to surprise and confound. "There have been plenty of QSOs made via sporadic-E in the colder months this winter, including a surprise opening from the Midwest and Western US to Australia and New Zealand just this week! QSOs on other forms of enhancement exist as well, thanks to tropospheric ducting and auroral propagation. Because of the advent of WSJT software, making QSOs via meteor scatter in the wee hours of the morning on 6 and 2 meters has never been easier. 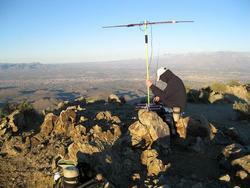 There are plenty of opportunities to make long-haul QSOs on the VHF+ bands in January." Read more here. Effective January 17, 2011, a new pricing structure will go into effect for the ARRL Outgoing QSL Service. With the new rate structure, amateurs will no longer need to count outgoing cards and then guess as to what to pay based upon a half-pound rate; a simple weighing of the cards is all that is necessary to determine what amount to send to the Bureau. This new structure also accommodates a small rate increase in response to recent postage, shipping and handling costs. Read more here. 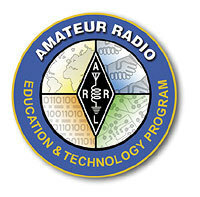 In December 2010, the ARRL Executive Committee reviewed grant applications for the ARRL's Education & Technology Program (ETP), awarding equipment valued at nearly $5000 to five schools. More than 525 schools across the country have received support from the ETP in the form of grants for equipment, curriculum and resources, as well as teacher in-service training through the Teachers Institute on Wireless Technology. Applications for equipment and resource grants are accepted twice each year; application deadlines are May 1 and November 1. Applications for 2011 summer sessions of the Teachers Institute are currently being accepted. Read more here. The ARRL Board of Directors will hold its 2011 Annual Meeting on January 21-22 in Windsor, Connecticut. Directors, Vice Directors and ARRL Board Officers will be in attendance, including two new Vice Directors who will be at their first Board meeting: Southeastern Division Vice Director Andrea Hartlage, KG4IUM, and West Gulf Division Vice Director John Robert Stratton, N5AUS. The Board will also welcome IARU Secretary Rod Stafford, W6ROD, and Radio Amateurs of Canada President Geoff Bawden, VE4BAW. The meeting will be preceded on Thursday, January 20 with meetings of the Board's Administration and Finance Committee and the Programs and Services Committee. At its January 2010 meeting, the ARRL Board of Directors decided to make the agendas of Board and Executive Committee meetings available on the ARRL website. The agenda for the 2011 Annual Meeting is available here. Per the Articles of Association the ARRL Board of Directors meets twice a year, in January and July. Students planning to apply for the more than 60 scholarships administered by the ARRL Foundation should be aware that the deadline is fast approaching. All materials -- including transcripts -- are due February 1. Beginning this year, applicants must submit all material electronically. No paper forms will be accepted. Read more here. Tad "I'm melting in the Sun" Cook, K7RA, reports: The average daily sunspot numbers declined 12 points to 38 during the week of January 6-12. 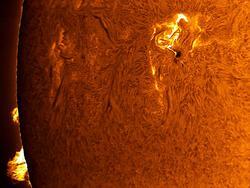 The average daily solar flux declined by nearly 6 points to 83.8. The latest forecast shows solar flux at 80 on January 13-15, 78 on January 16-19 and back to 80 on January 20-35, then rising to nearly 90 by the end of the month. The same forecast has planetary A index for January 13-22 at 5, 8, 7, 5, 5, 5, 5, 7, 7 and 5. Geophysical Institute Prague sees unsettled geomagnetic conditions on January 14-15, quiet to unsettled January 16, unsettled January 17-18, quiet to unsettled January 19 and quiet on January 20. The STEREO mission's coverage of the entire Sun is nearly complete, with continuous images showing more than 99.2 percent of our nearest star. By Sunday evening in North America, the project will have passed 99.34 percent coverage. The black band of unseen area is now just a tiny sliver, and magnetically active areas over the entire Sun may now be observed live from any place with an Internet connection at any time of the day or night. Look for more information on the ARRL website on Friday, January 14. For more information concerning radio propagation, visit the ARRL Technical Information Service Propagation page. This week's "Tad Cookism" is brought to you by INXS' Melting in the Sun. If you've ever wanted a way to show the world how exciting Amateur Radio can be, here's your chance: The ARRL is sponsoring its first-ever video contest! We are looking for ARRL members to shoot and submit videos that showcase how fun and electrifying our hobby is; extra points will be awarded for a video showing someone, young or old, licensed or not, making their first contact. Videos will be judged on overall quality and composition, and prizes will be awarded. The video author/producer must be an ARRL member; however, the people who appear in your video can be non-members. This contest is intended for amateur videographers. If you are a professional, please do not apply. Check out all the details -- including the fine print -- on the ARRL Video Contest Rules and Guidelines web page. Do you use a computer to send or receive CW? Do you subscribe to any publications that you read online? Do you have a separate room in your home that's dedicated strictly to your ham station? When operating SSB, do you use a speech processor? Visit the QuickStats page and be sure to bookmark it in your browser. Results from this QuickStats poll will be published in the April 2011 issue of QST on the QuickStats page, located in the rear advertising section of the magazine. Along with monthly poll results, QST QuickStats offers colorful charts and graphs that highlight interesting Amateur Radio statistics. William Voedisch, W1UD, of Leominster, Massachusetts, became a Silent Key on January 1. He was 78. Voedisch was an avid CW operator who especially enjoyed operating in the CW National Traffic System nets. In recent years, he was the Manager of the NTS First Region CW net and almost nightly represented the First Region in the Eastern Area Net. He was also active in the Transcontinental Corps, relaying messages to other regional nets around the country. Read more here. Go behind the scenes and meet a member of the ARRL HQ staff! This week we feature ARRL Assistant Production Supervisor Jodi Morin, KA1JPA, as she puts together an issue of QST. Click here and scroll down the page to the "Meet the Staff" video box to meet Jodi. All dates, unless otherwise stated, are UTC. See the ARRL Contest Branch page, the ARRL Contest Update and the WA7BNM Contest Calendar for more info. Looking for a Special Event station? Be sure to check out the ARRL Special Event Stations Web page. Subscribe to NCJ -- the National Contest Journal . Published bi-monthly, features articles by top contesters, letters, hints, statistics, scores, NA Sprint and QSO Parties.